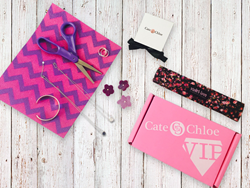 Cate & Chloe jewelry creates jewelry boxes #MadeWithLove and is partnering up with LA fashion brand Violet Love Headbands. Cate & Chloe jewelry believes that jewelry should be made with love. That's why they've partnered with LA based fashion designer Rebecca Michaels of Violet Love for their upcoming August jewelry box. In each VIP box, you can pair your jewelry looks with a bold and stylish “no slip, no headache” headband that's trusted yoga studios and seen on the streets of LA and is the accessory everyone's talking about.